Nissan Philippines, Inc. (NPI) celebrates its 2nd year anniversary by launching its “Rediscover Excitement, Rediscover Nissan” campaign, and by officially unveiling the boldly designed 1.6 CVT P980k Nissan Juke. The campaign aims to encourage car buyers to rediscover the car brand that was iconic in the 80s and 90s. In its first two years, Nissan Philippines brought refreshed versions of various Nissan vehicles to the local market. The Nissan Sylphy, a modern take on the Sentra badge. The Nissan Altima, which offers the excitement of driving while exuding elegance. The soon to be refreshed Nissan Almera, which offers unmatched space and comfort in a compact sedan. The Nissan X-Trail, the testosterone-driven compact SUV. The all new Nissan NP300 Navara, a tough and smart pickup providing a comfy ride due to its rear multilink coil spring suspension. The Nissan Patrol Royale, the prestigious large SUV capable in any road (now available at Php 3,990,000). Dealership expansion nationwide. From 28 dealerships, 11 more were signed up, covering the areas of NCR and Luzon (Sucat, Sta. Rosa, Bulacan), Visayas (Cebu, Iloilo, Dumaguete), and Mindanao (Butuan, Zamboanga, and General Santos). Nissanparts.ph lets you buy parts online. The Nisan Parts Online store portal will go live by November 3, 2015. When the service goes live, Nissan customers in the country can buy parts, accessories, and merchandise at affordable prices from the comforts of their homes. They also get to enjoy free shipping. Guaranteed 24 hour delivery within Metro Manila. The first Nissan GT Academy Philippine leg. Here, gamers are challenged to prove their racing skills on screen and on track. Joward Policarpio, one of the contenders, became the first ever Nissan GT Academy Asia Champion. Left to Right: Nissan Philippines, Inc. (NPI) President and Managing Director Antonio Zara, the new Nissan Juke, and NPI General Manager for Marketing SJ Huh. With a bold and dynamic exterior design, an intuitive Integrated Control System, a powerful 1.6L DOHC gasoline engine, and a Xtronic CVT transmission, the Nissan Juke is one of the hotly anticipated Nissan vehicles in the market. A clear reason for anyone to rediscover the excitement of Nissan. The Nissan Juke was first launched in Japan in 2010, underwent a minor change when unveiled at the Geneva International Motor Show, and this minor change model was brought to South East Asia. It was introduced in Thailand February 2015 and will be available in the country January of 2016. The new Nissan Juke will be available in the HR16DE 1.6L DOHC gasoline engine variant, coupled with the new generation Xtronic Continuously Variable Transmission (CVT) – this combination allows the Nissan Juke to deliver a smooth but exciting drive supported by an engine power of 116PS with 154Nm of torque. 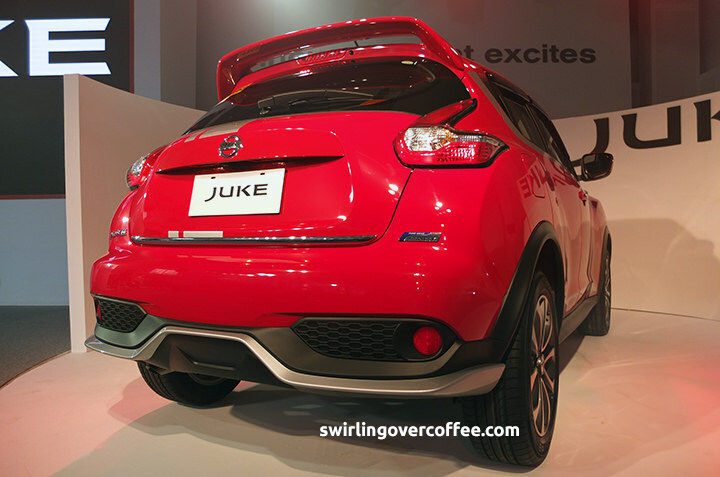 The Nissan Juke will be available as a 4×2 variant with an SRP of P980,000.00. It will come in Red Alert, Solar Yellow, Pearl White, and Black Obsidian. Expected start of sales will be on January 2016.